100 RPM includes stories by: Rowan Coleman, Angi Holden, Matthew Borgard, Stephen Shieber, Matt Hill, Nik Perring, Nasim Marie Jafry, Sylvia Petter, Cally Taylor, Angela Readman, Ray Robinson, Katie Gunn, Angela Powers, Nick Cernis, Sophie Mackintosh, P.W. Lewis, Laura Crosby, Dan Purdue, Stephanie Ressort, Jessica Patient, Ryan Millar, Máire Carr, Dave Cornmell, Ruth Aird, Nicola De Gouveia, D. J. Kirkby, Elizabeth Player, Dan Powell, Michelle Flatley, Isabel Serval, Sara Crowley, Lynsey May, Simon Kewin, Fat Roland, Cathy White, Karl McIntyre, David Kendrick, Vikki Ross, Alison Woodhouse, Scott Pack, Sal Page, Helen Ladderbird, Hannah Harman, Catherine Walter, Suzy Floyd, Sonya Oldwin, Sam Wyld, Rachel N Joy, Emma J. Lannie, Annie Evett, Jennifer M Schmidt, Anna Cardus, Jodie Ansted, Red Morgan, D.E. Oprava, Donna Henderson, Xenia Smith, Louise Pearson, Cassie Morrison, Cassandra Parkin, Sam Thewlis, Polly Burns, Pete Domican, Hannah Simpson, Crystal Schwanke, Jennifer Domingo, Polly Johnson, L J Hart-Collins, Lorna Louise Hutchinson, Rebecca Emin, Caroline Luxford-Noyes, Edward Price, Carole McDonnell, Sarah Dunnakey, Teresa Nusbaum, Simon Kearns, Mike Bursell, Lisa Richardson, Cath Bore, Alexandra Brown, Tracy Kuhn, Sylvia Kelso, Kim Smith, J Bateman-Irish, Sarah Hutchison, PC Wheeler, Jamieson Wolf, Theresa Milstein, Jacqueline Christodoulou, Emily Wheeler and Caroline Smailes. On 5th January 2012, Caroline Smailes, acclaimed author of ‘In Search of Adam’ and ‘Like Bees to Honey’ decided to put together a collection of one hundred flash fiction stories, all inspired by songs on You Tube. She decided the collection would be published as an ebook to celebrate the launch of Xbox Live TV and its integration with You Tube, and to raise money for ‘One in Four’, a registered charity which provides support and resources to people who have experienced sexual abuse and sexual violence. Caroline put out a writing challenge on her blog to writers across the globe and within days hundreds of entries were received – from first time writers, unpublished authors and published authors. The stories in the collection are inspired by a broad range of music genres and they evoke all kinds of emotions in the reader; humour, sadness, faith and hope. To me this book is a product of pure creativity; from the stories themselves to the detailed handstitched front cover design by Becky Adams; from the introduction by famous 1980’s teen-pop-idol ‘Nik Kershaw’; to the musically-themed book title. My story in the collection ‘Angel of Love’ is a story inspired by James Blunt’s song ‘You’re Beautiful’. A collection of 100 flash fiction tales, all stories are inspired by songs on YouTube, each story being 100 words or fewer. 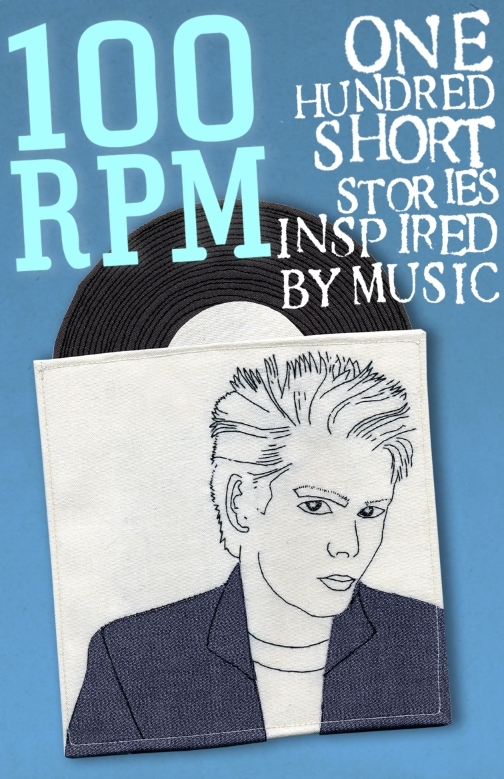 Inspiring, thought-provoking and often witty, 100 RPM caters for all musical and storytelling tastes. And, we’re especially excited that there’s an introduction by Nik Kershaw. I bought this book because an author whose novels I love compiled it and it’s raising money for a great charity. If I’m completely honest I wasn’t sure how much I would enjoy it as I’m not really a huge fan of short stories but this book may just have converted me because it is simply fabulous. The stories are all brilliant and even though they are all under one hundred words they have such power. I actually cried over two of them and nodded my head in recognition of the emotion in others. I love how the stories are all inspired by songs and I now have many of these songs swirling around my head. Some of these stories will stay with me for a very long time, they’ve really got under my skin in a way that a short stories never have for me before. This book is one I will definitely read more than once and I’ll be recommending it to everyone I know. Go buy it; you won’t regret it! These stories crowd off the page, they have such energy. The perfect pick up and read, and think. And then think some more. They have the potency of good poetry, and all the fascination of the best fiction, which can sometimes feel more ‘real’ or immediate than ‘real life’. There’s a lot of new talent in this book; expect to hear more from many of these great writers. This is a great read. I initially bought it because my good friend Sal Page has two flash fictions included and all proceeds go to charity. The stories are so good that I’m listening on YouTube to the songs that have provided the inspiration. Thanks to the authors for introducing me to musicians I’ve never heard of and to the authors that have been inspired by the songs I do know. For a small price for a good cause and amazing stories of 100 words or less everyone should have this on their kindle. I ate up this collection. It contains many powerful examples of the ways in which flash fiction can cut, as swiftly as the best poetry, to the bone – or move, and linger. Highly recommended. Love the concept, love the idea and love many of the tales. Consumed in under two hours on a Sunday morning, this collection has seriously inspired me and was a really fantastic read. I may not look at YouTube in the same away again but I will look Nik Kershaw up (he may be before my time). 100 RPM is not a collection you should miss out on, it made me want to sit down, listen to my favourites and write like crazy, a feeling which hasn’t come to me for a very long time – wonderful. …buy this collection! A collection of short stories [all less then one hundred words…perfect for the morning communte!] inspired by songs from You Tube. The stories are thoughtful, inspiring, quirky, funny and original. There’s a You Tube video that includes all of the songs used by each author as their inspiration/starting point, so you can listen along while reading! If you love music and words I would recommend this collection! All proceeds go to charity One in Four and there’s a foreword by Nik Kershaw. Brilliant stuff – you will find something in this collection that will touch your life and, through your purchase, you will help to change the lives of others. Buy it! Really enjoyed, “Tilting at Windmills.” Thanks! Just bought it. I like flash fiction and it’s for a good cause. I said I wasn’t going to buy any more books until I finished reading at least half my “to read” pile, but… oh well, I guess just one more won’t hurt 😀 it will give me something to do while waiting to get my computer back in a month or so. I borrowed a computer to write this.